Heirlooms Reunited: 1880s Autograph Album of Adelaide Augusta Whiting, "Addie", of Braintree, Massachusetts, student at B.H.S. 1880s Autograph Album of Adelaide Augusta Whiting, "Addie", of Braintree, Massachusetts, student at B.H.S. 1880s autograph album that belonged to Adelaide Augusta Whiting, "Addie", of Braintree, Massachusetts, kept while she was a student at B.H.S., presumably Braintree High School. Addie added notes to many of the pages to indicate the graduation year of the signer. The album is a softcover, approximately 7" x 4-1/4" and contains the sentiments of over 50 of Addie's relatives, friends and schoolmates. An alphabetical list of the signers appears at the end of this post. The album has several pages with preprinted illustrations scattered throughout. Some of the signers selected these pages. Adelaide Augusta Whiting, "Addie", was born 3 July 1868 at Braintree, Massachusetts, the daughter of George Sidney Whiting and Margaret (Friel) Whiting, who were born at Brockton or North Bridgewater, Massachusetts, and Ireland, respectively. 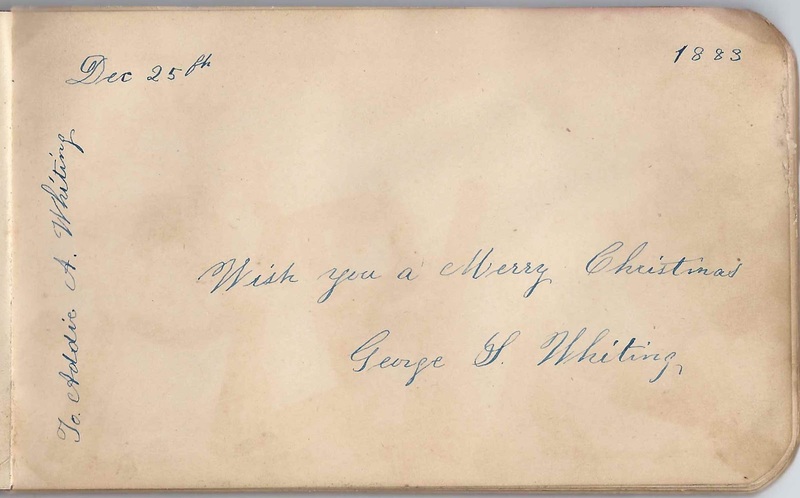 The first signed page in the album was that of Addie's father George Sidney Whiting of Braintree, Massachusetts, who signed the page on Christmas day in 1883; the album was presumably a Christmas gift to Addie. Addie married Frederic Henry Smith at Braintree, Massachusetts, on 24 December 1888. They had at least two children, daughters Elsie Irene Smith, born 26 July, 1894 at Holbrook, Massachusetts, and Marion Gertrude Smith, born in 1902 at Wakefield, Massachusetts. By 1910, Addie and Marion were living with Addie's mother Margaret at Braintree, Massachusetts; Addie called herself divorced. On 25 October 1912, at Portland, Maine, Addie married Saint John, New Brunswick native George Maxwell. By the time of the 1920 Census, widow Addie and her daughters Elsie and Marion were living at Natick, Massachusetts; apparently George had died by then. At some point, Addie moved to Oakland, California, perhaps to follow one or more of her daughters. The 1930 Census of Oakland, California, shows Addie living in the household of daughter Elsie and husband, Walter Edwin Hayward and their two children. Interestingly, three people with the surname Hayward signed pages in Addie's album. Walter's father was Charles Hayward, and there happens to be a Charles Hayward who signed a page in Addie's album, but I don't believe they were the same person. 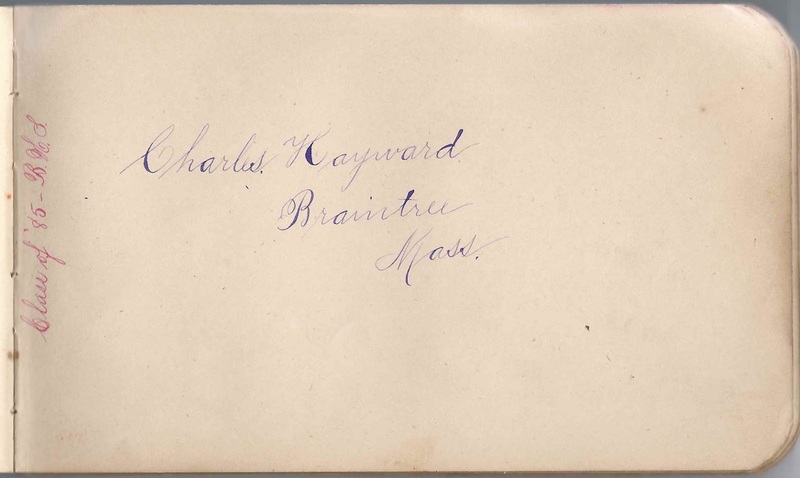 Addie noted that the Charles Hayward of Braintree, Massachusetts, who signed the page below was a member of the Class of 1885 at B.H.S. By 1940, Addie was living at Oakland alone. She died in California in 1944. Eliza Cronin of East Braintree, Massachusetts, signed a page on January 3, 1884 and mentioned B.H.S. The added note in red ink, presumably written by Addie, notes that Eliza was in the Class of 1884. Marion M. Fernald signed a page. Sadly, Addie's note indicates that Marion, a member of the B.H.S. Class of 1885, died in May 1885. 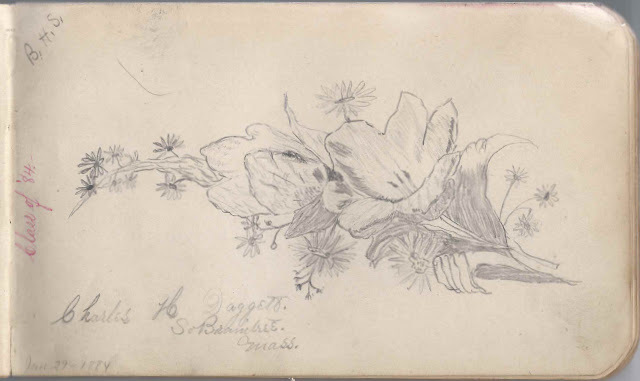 Charles H. Daggett of South Braintree, Massachusetts, inscribed a page with a sketch of flowers on January 29, 1884 and indicated he was a student at B.H.S. Addie's note: "Class of '84". Christina Henderson of South Braintree, Massachusetts, sketched a little girl in colonial clothing on the page she dated December 27, 1883. Addie's note: "Class of '84 - B.H.S." Carrie W. Allen, signed at East Braintree, Massachusetts, on January 7, 1884; B.H.S. 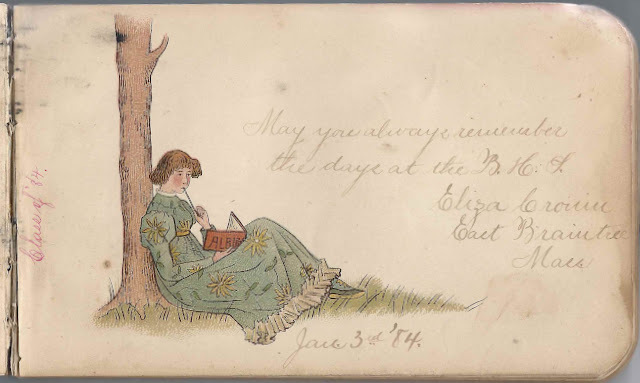 Note, presumably written by Addie: "Class of '84"
Lilla F. Anderson of South Braintree, Massachusetts, signed on March 13, 1884. In red ink, presumably written by Addie: "Class of '86"
Lula M. Anderson of South Braintree, Massachusetts, signed on March 13, 1884. In red ink, presumably written by Addie: "Class of '86 - B.H.S." 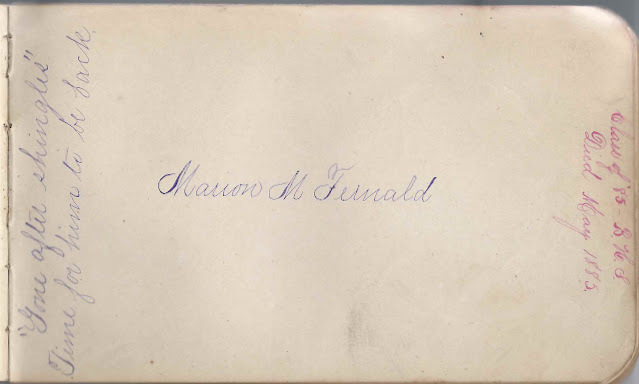 Helen W. Arnold of Braintree, Massachusetts, signed on December 31, 1883; T.A., B.H.S. In red ink, presumably written by Addie: "Class of '84"
Louis W. Arnold of Braintree, Massachusetts, signed on May 2, 1884. In red ink, presumably written by Addie: "Class of '86 - B.H.S." George A. Arnold of Braintree, Massachusetts, signed on April 16, 1884. In red ink, presumably written by Addie: "Class of '85 - B.H.S. Myron H. Belcher of South Braintree, Massachusetts, signed on February 15, 1884. In red ink, presumably written by Addie: "Class of '84 - B.H.S." Albert L. Cavanagh of Braintree, Massachusetts, signed on May 8, 1884. In red ink, presumably written by Addie: "Class of '86 - B.H.S." Eliza Cronin of East Braintree, Massachusetts, signed on January 3, 1884. In red ink, presumably written by Addie: "Class of '84"
Charles H. Daggett of South Braintree, Massachusetts, signed on January 29, 1884; B.H.S. In red ink, presumably written by Addie: "Class of '84" Charles sketched some flowers. Alice M. Dennehy of South Braintree, Massachusetts, signed on April 10, 1884; P.G.S. Ernest W. Dennett of Braintree, Massachusetts, signed on April 11, 1884. In red ink, presumably written by Addie: "Class of '85 - B.H.S." 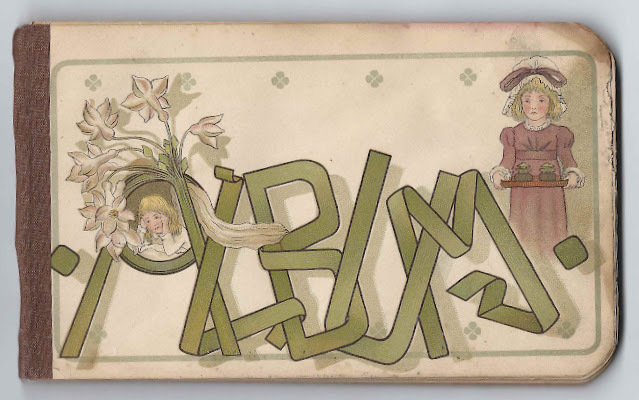 Lillian R. Dyer, signed on February 29, 1884. In red ink, presumably written by Addie: "Class of '84; B.H.S." Fred M. Fall of Braintree, Massachusetts, signed on April 11, 1884. In red ink, presumably written by Addie: "Class of '85 - B.H.S." Marion M. Fernald. In red ink, presumably written by Addie: "Class of '85 - B.H.S. ; Died May 1885"
Emma D. Follansbee of Braintree, Massachusetts, signed in March 1884. In red ink, presumably written by Addie: "Class of '85 - B.H.S." 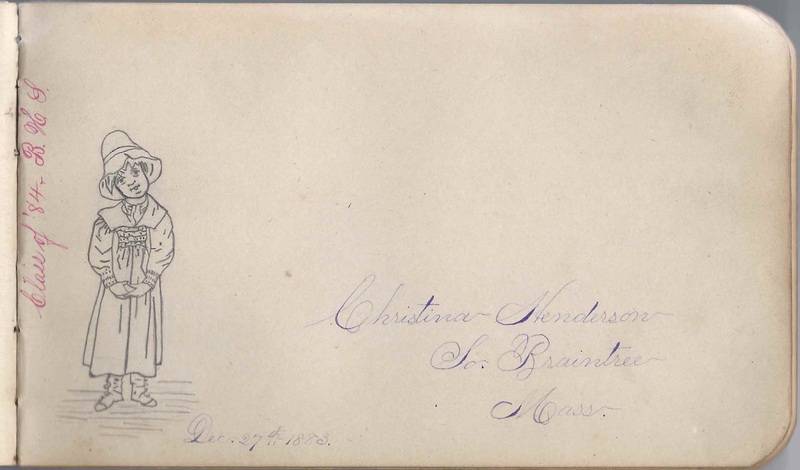 Isaline R. Hayden of B.H.S., signed at East Braintree, Massachusetts, on January 7, 1884. In red ink, presumably written by Addie: "Class of '84"
Alice A. Hayward of Braintree, Massachusetts. In red ink, presumably written by Addie: "Class of '84 - B.H.S." Charles Hayward of Braintree, Massachusetts. In red ink, written presumably by Addie: "Class of '85 - B.H.S." Agnes B. Hayward, signed in March 1884. In red ink, presumably written by Addie: "Class of '85 - B.H.S." Christina Henderson of South Braintree, Massachusetts, signed on December 27, 1883. She drew a little girl in colonial clothing. In red ink, presumably written by Addie: "Class of '84 - B.H.S." Annie G. Hill of South Braintree, Massachusetts, signed on February 7, 1884; Class of '84 B.H.S. Eddie W. Hill of Braintree, Massachusetts, signed on May 9, 1884; Class of 1886, B.H.S. Georgie E. Hollenbeck of South Braintree, Massachusetts, signed on March 18, 1884 at B.H.S. In red ink, presumably written by Addie: "Class of '86"
M. Helen Keith of Braintree, Massachusetts, signed on March 7, 1884. In red ink, presumably written by Addie: "Class of '85 - B.H.S." Sarah W. Lane, signed on March 6, 1884. In red ink, presumably written by Addie: "Class of '85 - B.H.S." Mary J. Long of East Braintree, Massachusetts, signed on April 7, 1884 at B.H.S. In red ink, presumably written by Addie: "Class of '86"
Joan MacGregor of East Braintree, Massachusetts, signed on January 9, 1884; B.H.S. In red ink, presumably written by Addie: "Class of '84"
Ella Macgregor of East Braintree, Massachusetts, signed on January 9, 1884; B.H.S. In red ink, presumably written by Addie: "Class of '85"
Wallace Macgregor of East Braintree, Massachusetts, signed on "1-9-84"; B.H.S. In red ink, presumably written by Addie: "Class of '84"
Grace E. Mann, signed on March 6, 1884. In red ink, presumably written by Addie: "Class of '85 - B.H.S." Josie H. Mayhew, signed at B.H.S. on January 10, 1884. In red ink, presumably written by Addie: "Class of '84"
M. Alonzo Minchin of Braintree, Massachusetts, signed on April 17, 1884. In red ink, presumably written by Addie: "Class of '85 - B.H.S.". He was Martin Alonzo Minchin. William B. Morse of East Braintree, Massachusetts, signed on February 15, 1884; H.G.. In red ink, presumably written by Addie: "Class of '84"
Estella W. Pierce, B.H.S., signed at South Braintree, Massachusetts, on January 8, 1884. In red ink, presumably written by Addie: "Class of '84"
Addie L. Porter of South Braintree, Massachusetts, signed on January 11, 1884 at B.H.S. In red ink, presumably written by Addie: "Class of '84"
D. Fredertic Potter of South Braintree, Massachusetts, signed on February 15, 1884. In red ink, presumably written by Addie: "Class of '84 - B.H.S." Frank F. Rudderham of Braintree, Massachusetts. In red ink, presumably written by Addie: "Class of '85 - B.H.S." Minnie D. Smith of South Braintree, Massachusetts, signed on March 13, 1884. In red ink, presumably written by Addie: "Class of '86 - B.H.S." Charles E. Stetson, signed on February 20, 1884 at B.H.S. Annie E. Sullivan of South Braintee, Massachusetts; B.H.S. 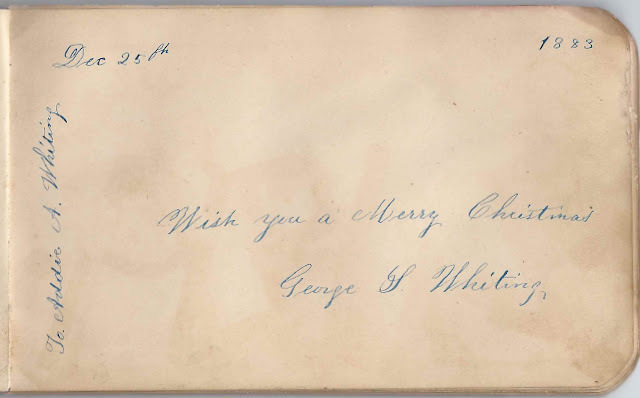 George S. Whiting, inscribed to his daughter Addie A. Whiting, on December 25, 1883. He was George Sidney Whiting of Braintree, Massachusetts. He was the first to write in the album and may have given the album to Addie for Christmas in 1883. Harry T. Whitman of South Braintree, Massachusetts, signed at B.H.S. on January 15, 1884. In red ink, presumably written by Addie: "Class of '84"
Wilford F. Woodsum of South Braintree, Massachusetts, signed on February 5, 1884. In red ink, presumably written by Addie: "Class of '84 - B.H.S."